Announcing the Fastest and Easiest Way For Special Education Teachers and Therapists to Quickly Find IEP Goals and Objectives!! Access to over a thousand IEP Goals and Examples IEPs that you can individualize and use immediately. Quickly and Easily Search or Browse through Goals for IEP to find what you need. Access to the Ultimate Resource directory. Simple but Powerful Forum to discuss issues with your peers. We have researched resource links to help you save time looking for other websites with IEP Goals and Objectives. 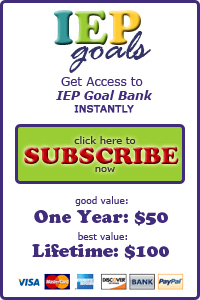 Guarantee: 30 Day, 100% Money-Back Guarantee: I want to give you one full month (30 days) access to our IEP Goals website so you can experience yourself the power of our IEP Goals. Browse or Search for Goals and Objectives for IEP. Use our social networking tools to collaborate with other Therapists. Put these goals for IEP to work for YOU. If you are not completely head-over-heels thrilled with the content and the results, I insist that you return it to me for a full, prompt, no-questions asked refund. No hassle, No problems, No payment. "Hi, new to this site…been a special ed teacher for 21 years and this is the first time I have ”cheated” and used a goal bank. I am so excited to not have to recreate the wheel each time I write an IEP."